Sturdy canvas stirrup design fits easily into any athletic shoe. The ProCare Lace Up Ankle Brace comes with a sturdy canvas stirrup design with removable, plastic medial/lateral stays, which provide support for acute ankle ligament sprains and chronic instabilities. This ankle brace fits easily into any athletic shoe. Measure the circumference of your ankle. does it come in any color besides black? 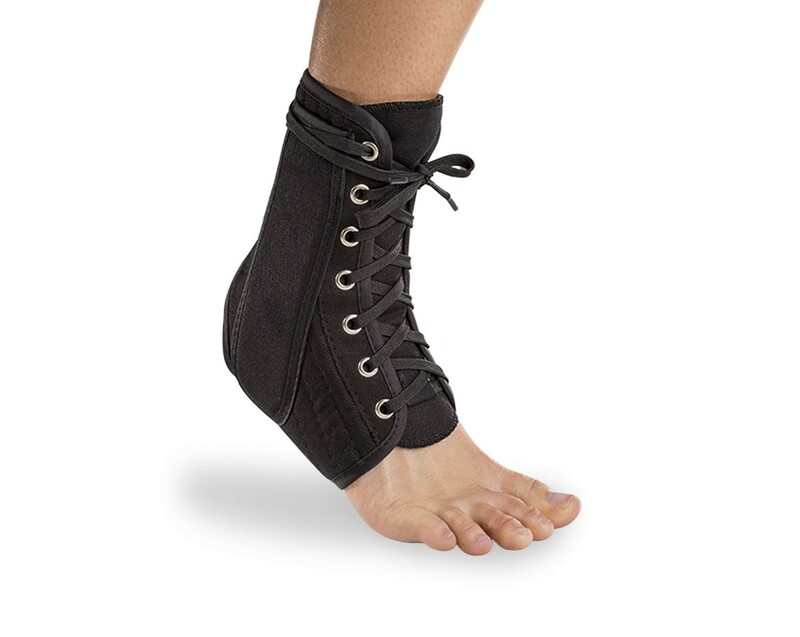 The ProCare Lace Up Ankle Brace only comes in black. Does this brace prevent dorsiflexion holding the ankle in neutral? The ProCare Laqce up Ankle Brace comes with a sturdy canvas stirrup design with removable, plastic medial/lateral stays, which provide support for acute ankle ligament sprains and chronic instabilities. I am currently using this brace with gray results after a bad sprain but have severe hand deformities and cannot lace it up without a huge struggle. I am looking for this same level of support and ability to wear inside my sneakers but with Velcro closures. Please help! I play basketball and I tie my shoes pretty tight. The tops almost touch. But I still role my ankle when I run. Can I wear this when I play in games and practice? Will it fit in my shoe? Would you recommend it for me or would you recommend another brace? Thank you for your question. Although, the Procare Lace Up Ankle Brace provides support to the ankle I believe a better option bracing option would be the DonJoy Stabilizing Pro Ankle Brace. The Stabilizing Pro provides greater support with a lace up design, trimable figure-8 strapping locks and medial/lateral stays. This brace is designed to fit easily into an athletic shoe or street shoe. Please see hyperlink below for additional information or contact 800-553-6019 with any questions. Would this brace be good for gymnastics? Can it be worn during all competitive events? Would this brace aid in normal heel-to-toe walking for a long-time toe walker? If so, would tightening it provide greater effect towards that goal? If not, might you point me in the direction of a brace suitable to that goal? Does this brace have the strips that wrap under the arch of the foot and that add arch support? Can you advise if this Procare brace would offer moderate support for both stability assistance and prevention of rolling in of the ankle as well as good compression and arch support? I'd also like a brace that visually isn't as "clunky" as some of your other braces that have three inch straps that wind around above the ankle. Thanks. Would this be recommended for snowboarding and or fit inside a snowboard boot for additional ankle support? How stable are the sides? Is it a metal plate inside that keeps it from bending, and is this good for wearing during sports like basketball? Is the heel enclosed or exposed in this brace? This brace has an exposed heel. Thank you for your question. This brace will offer you good support. Some people don't mind the brace in the boot others do not like the semi rigid portion in the boot. The rigid piece in the DonJoy Stabilizing Pro ankle brace is removable, that may be a better option. If you do not like the feel of the rigid piece it can be removed and still offer you support. Would this be a good brace for Kite Surfing? I've tried the Don Joy Velocity brace, but the Velcro straps don't stay fastened because of the water. I think a lace up brace would be better. Your thoughts? This product would be excellent brace for that. Also, can the ankle brace be machine washed (like on the gentle cycle) if it gets dirty or smells? If not, how should I clean it? The ankle brace is washable, however we do not recommend that it be put into a washing machine or dryer. Our washing instructions are to wash by hand in lukewarm water with a mild soap and water and all for it to air dry. In the past customers have soaked the brace in a mild soap (Woolite). Could you please provide a diagram of what part of the ankle to measure around? I'm still a little unsure. I've had my ankle circumference measured in several different locations before. Thank you. Unfortunately we do not have diagrams available. When measuring your ankle, you start at the top of your ankle joint, where your ankle flexes. You take your tape measure and wrap it around your ankle, beneath the heel of your foot and back around to the original starting point. The size chart does not say if it's for men or women. So I am not sure how to find my size. The Med is for 8 1/2 to 10. Is this a womens size? The numbers are not based on shoe size, it's based on ankle circumference. Measure at an angle from the top of the heel, around both ankle bones. This a canvas material, so it will be more of a stiff material. I would suggest looking at the A60 or Airsport, either of those have a material that will form to the foot better. can you email me a picture of the stays ? also do the stays come with the purchase price of 29.99 or are they seperate? We don't have a picture of the stays as they appear within the brace, but the stays are included in the price of the item. Broke my ankle almost two years ago. Got this from the doctor I was going to. It has made a huge difference for me. my ankle stays in place and it doesn't turn inward. Nice to be able to walk with confidence. Good product, stitiching of rough seems needs to be changed. The inside stitching is very rough and uses nylon threads, I had to cover it with tape. This problem could have been avoided. Other than that, I like the boot very much. Good support, very reasonable price! I've compared this brace with the suggested one at my doctor's office. It is the exact one but only much cheaper. The construction is supportive but adjustable - all in the right places. Very pleased. This is my second purchase of same brace in 8 years. Pros: Fits shoes very well...there are shoes that are too tight with just a pair of socks on, so don't expect any kind of brace to fit those shoes. The brace exceeds my expectations. It provides support exactly where I need it. I'm in the latter stages of recuperation from a dislocated ankle with several broken bones. I no longer need the cast nor the walking boot but I still need support while undergoing physical therapy. This brace meets that need. Pros: It's adjustable in terms of making it as tight or as loose as you'd like and yet still provides total ankle support. I highly recommend it. Good support, but doesn't fit into athletic shoe. The brace supports my ankle nicely after a sprain, but it doesn't at all fit into an athletic shoe as promised. Great product. Bought for my mom and I. It is very good quality and exactly as shown. I have bad pronation and this has helped me walk again without pain and with confidence. It is the best brace I found to keep my ankle stable while working on it. Pros: Easy to put on and doesn't hurt my foot the way it is formed when wearing it. I first used this when I sprained my ankle, and for me, it did the job well and I could walk with confidence. AND, no problem with it fitting in the shoe. ... my ankle, all of a sudden would double-over, after that sprain without it. Now, I've discovered I have drop foot and have to wear a modified AFO brace.